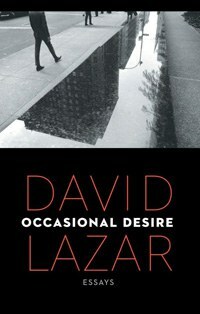 David Lazar's writing in Occasional Desire: Essays is personal yet scholarly, funny yet melancholy, familiar and warm, yet experimental and original. In the world of essay writing there is a gap that is rarely filled, between the mass-market dilettante approach of magazines like the New Yorker, the proudly obscure realm of academia, and the emotional acuity of the memoirist. In Occasional Desire, David Lazar seeks to piece together the best elements of these differing styles, defining and demonstrating his ideals for the essay form while ruminating on Curb Your Enthusiasm, death, and public pay phones in the process. His writing is personal yet scholarly, funny yet melancholy, familiar and warm yet experimental and original. For Lazar a quality essay is defined primarily by its openness and freedom in approach, dictated by the desires of the writer rather than a prescribed format. In the last essay of this section, "The Coat", Lazar recounts how he bought a Sligo coat from a second-hand store in Ireland, only to pass a window and, on seeing his reflection, sees “a fleeting image of myself as a dumpy man in a frumpy coat”, and tries to get rid of it. There is a sharp break at the end – Lazar, writing the essay, sees a child on a bike hit by a truck outside his window – and it suddenly lurches to unexpected self-awareness. Accordingly, Lazar shifts sharply to a more analytical style to write about essays themselves in the middle section, “Ostensible Occasions”. He's a great lover of the form and the many possibilities that are inherent within it, as represented by favorite writers like Charles Lamb, Michel de Montaigne and George Orwell. Here Lazar’s background as a professor of creative writing and English at Columbia College Chicago surfaces in his skill at quick dissections of passages from favorite essays and poems like The Waste Land, which are incisive yet never heavy handed. As you may have noticed, I have moved from autobiography and memoir to the essay. Surprised? Am I not performing my own desire in this essay, the occasion being, among other things, a response to autobiography’s seeming hegemony in the world of ‘creative nonfiction.’ Perhaps we need a separate camp, of destructive nonfiction, a wider, wilder, grayer zone, in which the essay and other fugitive forms, known and as yet undiscovered, can ply their wayward trades, following those occasional desires into open forms that… challenge facets of the imagination beyond the complacencies of memory’s narratives. This is thrilling and exasperating writing, and a good part of what makes Lazar’s book so captivating. He's modestly yet boldly forthcoming in a way that flirts with arrogance. He's challenging writers and readers to challenge themselves, while creeping into a vein of academic Puritanism and snobbery. Sometimes I found this annoying, but more often I thought this makes his writing hopeful and brave and honest in a way seldom encountered. It's refreshing to read an essay that is not trying to tap dance its way into your heart. In the final section, “The Art of Survival”, Lazar sets out to tackle the challenge he has set for himself, to demonstrate what he means about “following those occasional desires into open forms”. Over the course of “On Gifts” he considers the perfect gift, wrestles with desire, indulges in humorous asides (“I think diamonds are beautiful, in the way that I think kaleidoscopes are beautiful, or prisms, or sun catchers.”), adopts the tone of an etiquette columnist, and slips into the reverie of childish want. In “Death, Death, Death, Death, Death, Death” and “On the Art of Survival: North by Northwest”, he breaks apart the structures into discrete parts that gather into a whole. As with any writing that contains an element of experiment or risk, this section is the most uneven, though also the most interesting and winning in its studied looseness. If, as Lazar contends, “The most memorable essays are formally labile and so stretch our sense of what essays might be,” I won’t be forgetting about this book anytime soon.